Gaston County is located on the South Carolina border, west of Charlotte. It is a fairly large county at over 200,000 residents. The county seat is Gastonia. The county emerged as a center of the textile industry around the turn of the twentieth century. Northern industrialists moved south looking for cheap labor, and they found a rich source of it in Gaston and the surrounding counties in the region. Increased tensions between workers and management resulted in the Loray Mill Strike in Gastonia, one of the most notable events in the history of the labor movement. Unlike most urban counties in North Carolina, Gaston has not seen substantial growth. This is despite a favorable location adjacent to Mecklenburg County. Overall the county has had difficulty diversifying its economy, even as textiles have fallen into decline, and the county is less educated than most other urban counties. Gaston has retained a very strong Republican character. Democrats are strong in Gastonia. Outside of Gastonia, support for Democrats is nonexistent. Recently, however, Gaston has trended Democratic, thanks to growth and increased registration of African American voters. Obama did worse in the county overall in 2012 than he did in 2008, though he did manage to pick up one precinct in Gastonia. Republicans dominate the county’s legislative delegation, and also control the Board of Commissioners. Forecast: Gaston County is expected to remain solid Republican for the near future. Overall, growth trends favor Democrats, but only slightly. Gaston will move closer to the national average only if African Americans maintain their high level of turnout as in the past two elections. The county’s growth rate during the 2000s was 8.26%, below the national average. But the black population grew at a rate of 19.03% while the white population barely grew at all. Hispanics constitute 6% of the population. 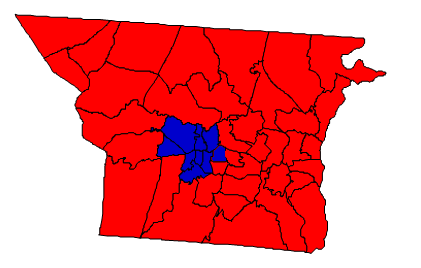 The bottom line: Though an urban county, Gaston is more old South than new South, and votes accordingly. Republicans need the staunch support of Gaston County residents in order to win statewide, though it is no longer as pivotal to their chances as it used to be. Rep. Patrick McHenry is from Cherryville, located in northwestern Gaston County.